Forward C.J. 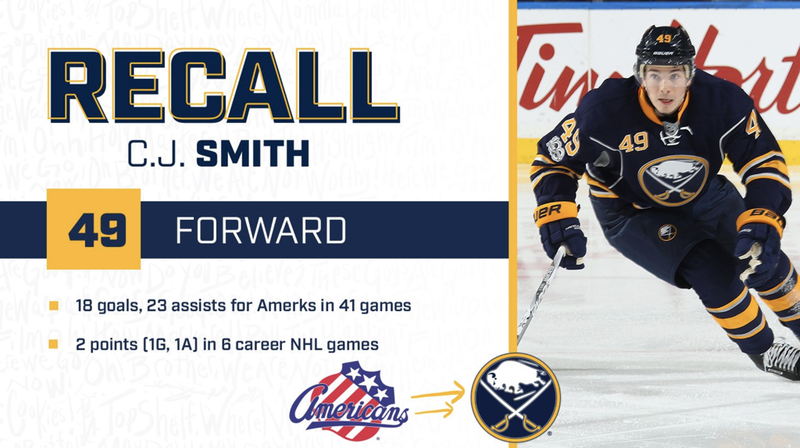 Smith scored his first career NHL goal on January 8 against the New Jersey Devils. 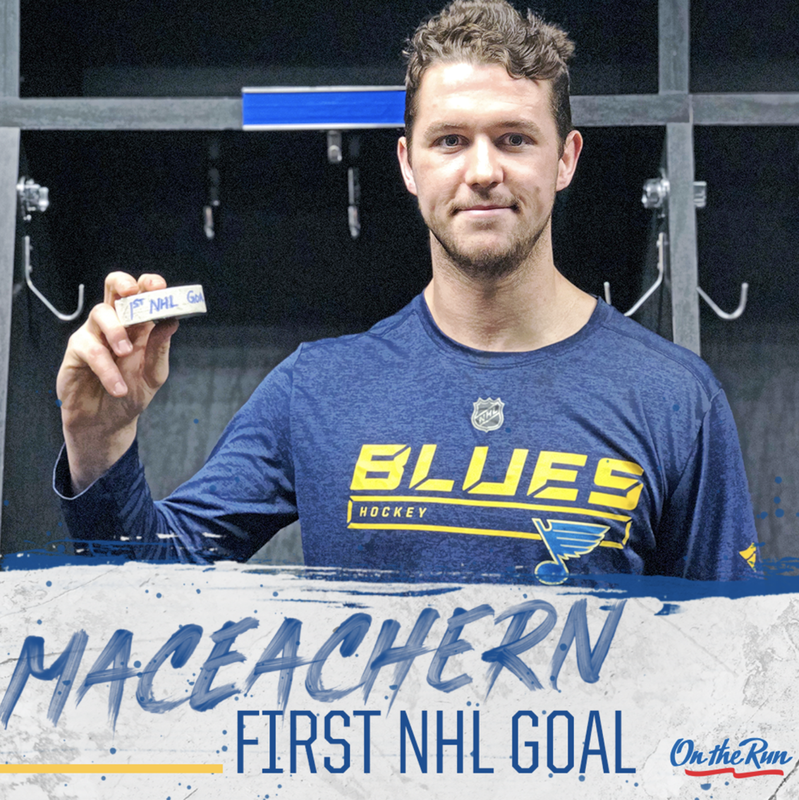 Forward Mackenzie MacEachern recorded his first career NHL goal, and point, on January 21 against the Los Angeles Kings and then recorded his first career NHL assist in the next game, a road game against the Anaheim Ducks. He was called up from the San Antonio Rampage (AHL) for his first stint in the NHL on January 10. Defenseman Jaccob Slavin picked up 10 points (2-8-10) as he registered a point in eight of the team’s 12 games in January. Slavin closed the month on a three-game point streak (0-5-5), including a three-assist game on January 20 in a 7-4 road win over the Edmonton Oilers. 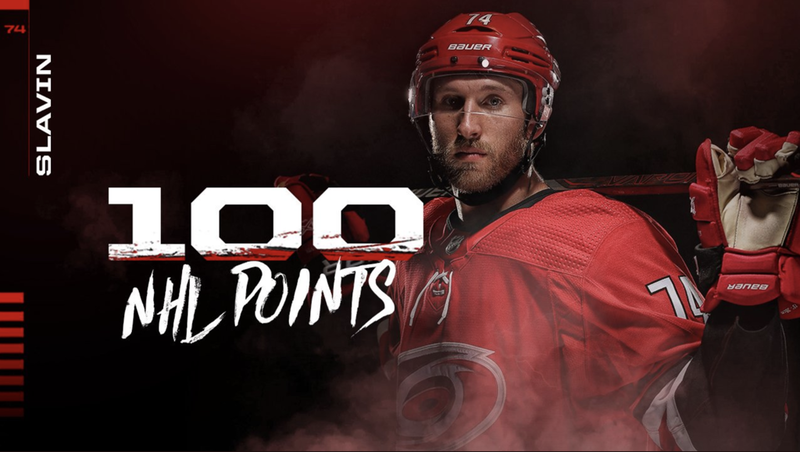 Slavin also picked up his 100th career NHL point with a goal on January 8 against the New York Islanders. Defenseman John Moore had his first multi-point game of the season (0-2-2) on January 8 in a 4-0 win over the Minnesota Wild. Griffins defenseman Jake Chelios had both a three-game point streak (0-3-3) as well as a multi-point performance (1-1-2) in January. The Chicago native has 11 points (1-10-11) this season. Forward Steven Fogarty ended January on a three-game point streak (2-2-4) and has 27 points (11-16-27) this season. Defenseman Nolan Valleau registered a three-game assist streak (0-4-4) in the middle of January and now has 14 points (2-12-14) this season. #SteelAlum appeared on all five editions of B1G Hockey’s Three Stars of the Week during January. Cale Morris (Notre Dame) appeared twice, earning the First Star on January 3 and Second Star on January 29. Mitchell Lewandowski (Michigan State, #2, January 22), Tanner Laczynski (Ohio State, #3, January 22), Blake McLaughlin (Minnesota, #3, January 15), and Tommy Nappier (Ohio State, #3, January 8) all appeared once throughout the month. Steel alumni have now been included in eight of the 16 weeks so far this season. 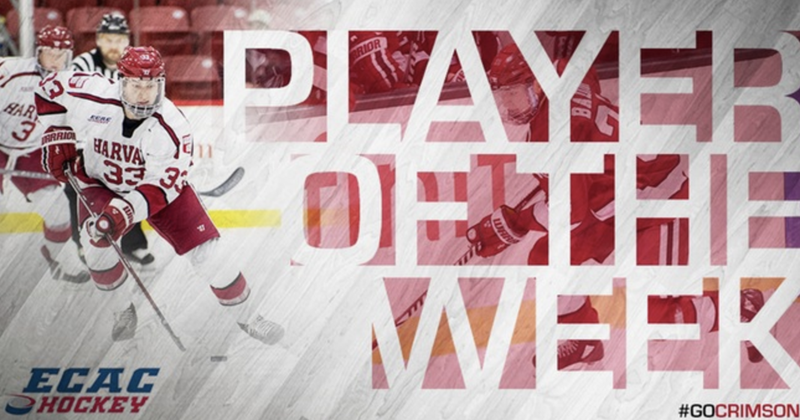 Harvard forward Jack Badini took home the ECAC Player of the Week award on January 27 after a four-point (2-2-4) weekend as the Crimson beat No. 9/10 Clarkson twice. On Friday, Jan. 25, Badini had a three-point night (2-1-3), which tied his career best mark, in a 4-3 win. Western Michigan’s Trevor Gorsuch was named the NCHC Goaltender of the Week on January 28 after he backstopped the Broncos to a weekend sweep of then-No. 4/3 Denver. Gorsuch came up big in the wins making a combined 33 saves in the third period. He also made a combined 21 saves with his team shorthanded as the WMU penalty killers finished the weekend 13-for-14. Mercyhurst defenseman Joseph Duszak was named the HCA Player of the Month for January after he recorded 17 points (9-8-17) in eight games. Duszak’s high-scoring January also landed him the Atlantic Hockey Player of the Month award. Forward Mason Bergh had a five-point (0-5-5) month, which tied his most productive month this season after also recording five assists in October. Forward Christiano Versich scored a goal in back-to-back games on January 19 at Denver and January 25 at Miami. Versich has 11 points this season. Forward Blake McLaughlin had a five-game point streak in January as he recorded seven points (3-4-7) and scored in all but two games during the month. The freshman was drafted last season by the Anaheim Ducks in the 3rd round (#79 overall). Forward Brannon McManus also had a great January as he had a six-game point streak and picked up 10 points (4-6-10) in the month. Goaltender Trevor Gorsuch finished January with a 6-2 record including only allowing one goal in four of the games. Gorsuch has a 13-4-1 record this season. Rookie defenseman Michael Joyaux picked up his first career NCAA point, an assist, on January 4 against Connecticut. Forward Canon Pieper picked up his first two points of the season, both assists, during January. Both were primary assists, the secondary on each went to Patrick Shea, the older brother of current Steel forward Neil Shea. Forward Eduards Tralmaks had his most successful month of the season in January, picking up four points (3-1-4) in eight games. Forward Tanner Laczynski had a point (3-6-9) in five of his six games in January, including a three-game stretch that saw him pick up seven points (2-5-7). Goaltender Tommy Nappier won all three of his games in January and now has a four-game win streak that dates back to December 29. Nappier picked up a 29-save shutout January 5 at Michigan State. Rookie defenseman Graham Lillibridge picked up his first career NCAA goal on January 19 against St. Lawrence. Junior defenseman Billy Sweezey picked up his first points of the season in a multi-point game (1-1-2) on January 5 at New Hampshire. Reigning Big 10 Hockey Freshman of the Year Mitchell Lewandowski ended January on a six-game point streak (5-3-8) that included a four-goal weekend against University of Minnesota. Defenseman Zach Osburn had a three-assist night on January 20 in a 5-3 win over Minnesota. Rookie defenseman Wyatt Aamodt picked up his first NCAA goal and multi-point game (1-1-2) in a 5-3 win against Lake Superior State. Forward Jake Jaremko had a four-game point streak in January that saw him pick up seven-points (2-5-7) including a three-point (1-2-3) game against Ferris State on January 11. Junior defenseman Joseph Duszak recorded a point in all eight games for Merrimack in January en route to a 17-point (9-8-17) month. Duszak’s 11-game point streak started on December 8 and has included eight multi-point games including a four-point (3-1-4) night on January 4 against Holy Cross. With 37 points (14-23-37) through January, Duszak is currently second among NCAA scorers and leads the next best defenseman, Chase Priskie from Quinnipiac, by eight points. Forward Jack Badini picked up five (2-3-5) of his 12 (5-7-12) points this season during January. The Anaheim Ducks prospect recorded a three-point night (2-1-3) in a 4-3 overtime win against Clarkson. Defenseman Reilly Walsh picked up the overtime game winner that night as Badini picked up the primary assist to seal the win. The goal was part of a five-point (2-3-5) month for Walsh, who is a New Jersey Devils prospect. The five Steel alumni currently on Providence’s roster (Jack Dugan, Brandon Duhaime, Ben Mirageas, Jason O’Neill and Greg Printz) combined for 22 points (7-15-22) in January, more than 32 percent of the team’s offense. Dugan led the way with seven points (2-5-7) and O’Neill had five (2-3-5) while both Printz (2-2-4) and Duhaime (0-4-4) each recorded four. Rookie forward Austin Magera picked up six points (3-3-6) in three games, including a three-point game (1-2-3) on January 19 against Air Force. Forward Sebastian Vidmar picked up a pair of multi-point performances during January as he registered a goal and an assist on January 4 against St. Cloud State and January 25 against Yale. The senior from Sweden has more multi-point games (8) than single-digit games (2) this season as he has 18 points (8-10-18) this season. Sun Devils forward Johnny Walker recorded his sixth multi-goal game of the season on January 26 in a 3-0 road win against Boston University. Walker finished the month with 21 goals this season, which still leads all NCAA scorers. Senior forward Robby Jackson registered a point in five of seven games (4-2-6) through January. The Alameda, Calif. native has 25 points (11-14-25) this season. Latvian forward Haralds Egle kicked off 2019 with seven of eight January games picking up nine points (4-5-9) in the month. Freshman forward Zach Risteau picked up four points (2-2-4) in six games in January. Forward Connor Murphy picked up his first two goals of the season during January. The Ancaster, Ontario native scored against Arizona State on January 11 and Dartmouth College on January 19. Last season’s Steel captain, defenseman Derek Daschke, notched five points (2-3-5) in January, including his fifth multi-point game of the season on January 4 against Providence (0-2-2). Senior captain Fredrik Olofsson recorded a point in four of six games in January for a six-point (1-5-6) month. The Chicago Blackhawks prospect has 30 points (10-20-30) this season, his highest scoring season in his collegiate career. Sophomore forward Koby Bender scored his first career collegiate goal on January 26 against Nebraska-Omaha. AIC forward Chris Dodero recorded multiple two-assist games in January. The first was against Sacred Heart University on January 8 and the second was at Mercyhurst on January 26. Eagles forward JD Dudek recorded four (3-1-4) points during the month of January. The New Jersey Devils prospect had one point this season outside of his productive January. Forward Jack Gessert had four points (1-3-4) in January after getting on the scoresheet for the first time this season on December 30.